Serendipity plays a part in some of the most rewarding natural history observations. Thus it was that in 2004, two fortuitous events added a new species to the Worcestershire list of micro-lepidoptera and changed the status of another from “extinct” to what could well be termed flourishing. A traffic jam on the A438 while returning to Cheltenham from Malvern gave the opportunity to survey the hedges along the embankment west of The Mythe (SO 8833) which revealed the presence of a number of large Field Maples (Acer campestre), which is the food plant of the tiny micro-moth Stigmella aceris. 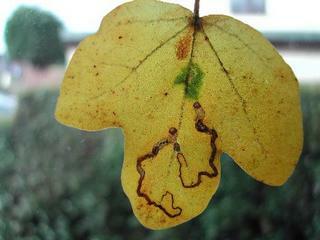 Returning for a more detailed survey on 8 September 2004 revealed a few mines of the species in the Field Maple leaves thus constituting the first record of aceris in VC 37. A large amount of Field Maple was also found along the lanes around the village of Bushley, but most of this had been pruned hard by flail cutting and there were no mines in that area. Subsequent visits to south Worcestershire in 2004 and 2005 showed the moth to be quite widespread (Fig 1) in an area stretching from Durbridge Mill (SO 7329) in the west to The Mythe (SO 8833) in the east and from Staunton (SO 7728) in the south to Gullers End (SO8535) in the north, i.e. an area approx 15km E-W and 7km N-S. All of these locations are in VC 37, although some of them are now in the modern administrative area of Gloucestershire. It is intriguing to speculate on how an insect not previously recorded in the area could prove to be so widespread. Part of the answer lies with observer effort and the comparatively small amount of attention given to micro-moths. In addition, the species seems to be undergoing a dramatic expansion of its local range both at Ledbury (Herefordshire) and in Gloucestershire (1). In the latter case the species was first recorded in 1991 and has since been found in 60 monads. Indeed the pattern in Worcestershire can best be interpreted in the context of the distribution of the species in the ‘Three Counties’ as a whole. 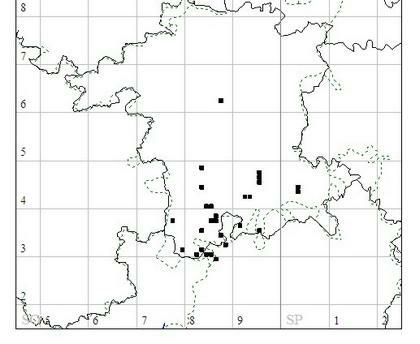 The original Gloucestershire record was from Apperley (SO8628) and now the species occupies two bands; one radiating southwards along the River Severn and the other towards the north-west along the Leadon valley (see Fig 2). As yet the Herefordshire and Worcestershire populations are still separated by the narrow band of the east side of the Malvern Hills, although the food plant is common here. 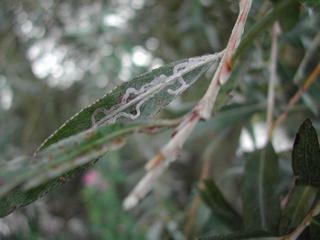 Sheltering from a heavy storm at Upper Lode, near Tewkesbury was the second fortuitous event, as this resulted in a record of the distinctive mines of another micro-moth, Phyllocnistis saligna, in the leaves of a White Willow (Salix alba). Historically there are but few records of the species from vice counties 33, 34 and 37. In Gloucestershire, one was recorded at Stroud in 1953, while in Worcestershire the last record was in 1873 and the species was regarded as extinct (2). Between September 2004 and September 2005 I amassed a total of 76 monad records of Phyllocnistis saligna from the ‘Three Counties’. The records in Worcestershire range from Chaceley in the south to Salwarpe near Droitwich in the north and from Hollybush in the west to Evesham in the east. Not surprisingly, given the association with willows, there is a close relationship between the location of the mines and the valleys of the Rivers Severn and Avon (fig.3). The map shows clusters in the Chaceley area, which is in modern day Gloucestershire, at Upton on Severn, and in the Avon valley at Pershore and Evesham. Away from the Severn, are the examples in the west at Eldersfield, Longdon Marsh and Hollybush Common. As with the previous species, the question arises as to how a moth that was thought to be extinct could have such a wide distribution in the county. The records reviewed here suggest that too restrictive an association has been made between the insect and its food plant, as a consequence of which the species may have been overlooked. The records are mainly based on vacated leaf mines, although some, from November and December, when the trees had lost most if not all of their leaves, are of mines in twigs and stems where their whitish colour and blunt ended form were still conspicuous. In fact, this is the best time to look for mining evidence, especially on pollards where the height of the wands precludes a close examination of the foliage in the summer. Even in the winter months close focusing binoculars are a must to aid recording. Table 1: Food plant data for Worcestershire. Clearly, where the plant species could be identified, S. alba predominates. S. fragalis comes a long way behind and is only as important as S. x sepulcralis (Weeping Willow). Many of the records made in November and December were from trees which could not be categorised as either fragalis or alba. Many of this group were either pollards or were growing in hedges which had been cut in the 2003/4 winter and had put out new wands during the summer. As already suggested, mines in the twigs are very conspicuous in the winter months and when present in profusion, give the willow wands a frosted appearance. No examples of Purple Willow (Salix purpurea) have been found, despite hours of fieldwork. Whereas Phyllocnistis saligna takes readily to the new growth induced by heavy pruning, Stigmella aceris shows a preference for large unkempt trees or bushes and does not seem to take to manicured hedges. GAUNT R 2000. Gloucestershire moths - an account. Published by the author; HARPER MW & SIMPSON ANB 2003. The Smaller Moths of Herefordshire and Worcestershire, Part 1. Butterfly Conservation.